Gather your mates. Show our new film. Pray for change. Sixty years ago, in 1955, a young Dutch chap called Andrew filled up a suitcase with flyers about Jesus and headed off to Poland to crash a communist youth festival. During his time in Poland he first met Christians who were persecuted for following Jesus. God moved. He was changed and from that point on Andrew risked it all to follow God’s lead, serving the persecuted church all over the world. We’ve made a short movie that explores Brother Andrew’s decision to step out and say ‘Yes’ to God (watch it up there). The film also tells the story of some amazing Christians in Syria who are risking everything to follow Jesus in the midst of war, persecution and devastation. Gather your mates. Show our film. Pray for change. 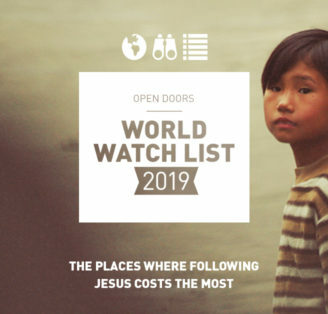 Run a simple Secret Screening in your living room, garden, church or local hang out and spend an evening with your friends exploring what it means to risk it all for Jesus. Show the film, get inspired, think about the issues and pray for change. Fill out the form over there to access a download of the film (or order one on DVD) and grab loads of other resources to help you hold a Secret Screening. We’ve included little guide with everything you’d need to know about running a simple event, plus you can also download invites, posters and tickets to promote your screening. 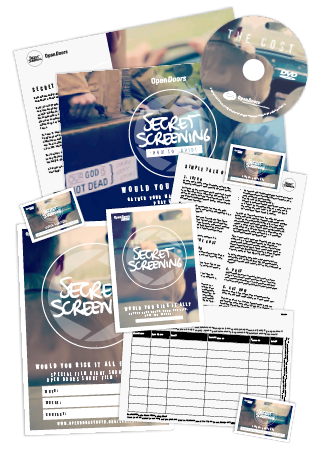 We’ve also included some talk notes, and a prayer powerpoint you can use as part of your Secret Screening! Get started by filling out the form and start downloading now! Grab your Secret Screening pack! Thinking of holding a Secret Screening and showing 'The Cost' to your mates? Fill out the form below to grab a copy of the film either as a digital download or DVD (we can only post DVD copies to UK addresses, sorry). Plus you'll get access to a bunch of other quality resources to help you host an awesome Secret Screening! Go on, do it! Sorry - we can only send resources to UK residents. You can download our resources below if you're from outside the UK. What format of 'The Cost' film would you like?